Смена поколений Subaru Legacy состоялась в 2019 году. Последняя версия популярного седана официально дебютировала на открывшемся автосалоне в Чикаго. Subaru на автосалон в Чикаго привезла пусть абсолютно новое поколение седана Legacy. 7-я версия популярной модели появится в продаже осенью 2019 года. Но это в США. Новое поколение модели построено на платформе Subaru Global Platform, которая обеспечила более жёсткий кузов с низким центром тяжести, что улучшило управляемость седана. Кроме того, создатели обещают снижение уровня шума в салоне на 3 Дб при движении по шоссе. Дизайнеры развили стиль предыдущего поколения Legacy, чтобы сохранить преемственность машин, но вот салон изменился полностью. Комплектации Premium, Sport и Limited получили новый 11,6-дюймовый экран мультимедийной системы портретной ориентации. В версии Touring ко всему функционалу добавляется ещё и навигация. У базовых версий вместо этого планшета пара 7-дюймовых экранов для мультимедиа и системы HVAC. Кроме того, в салоне есть AUX-разъём, пара 12-вольтовых розеток и квартет портов USB. Во всех комплектация Subaru Legacy оснащается фирменным комплексом систем безопасности EyeSight Driver Assist Technology, который включает в себя адаптивный круиз-контроль, систему удержания полосы, контроль за усталостью водителя и мониторинг слепых зон, а также ряд других функций. Другим серьёзным изменением стал перевод машину на 260-сильный 2,4-литровый турбомотор от кроссовера Subaru Ascent. Доступен и 2,5-литровый атмосферный 182-сильный оппозит, но для обоих двигателей коробка передач одна — вариатор. 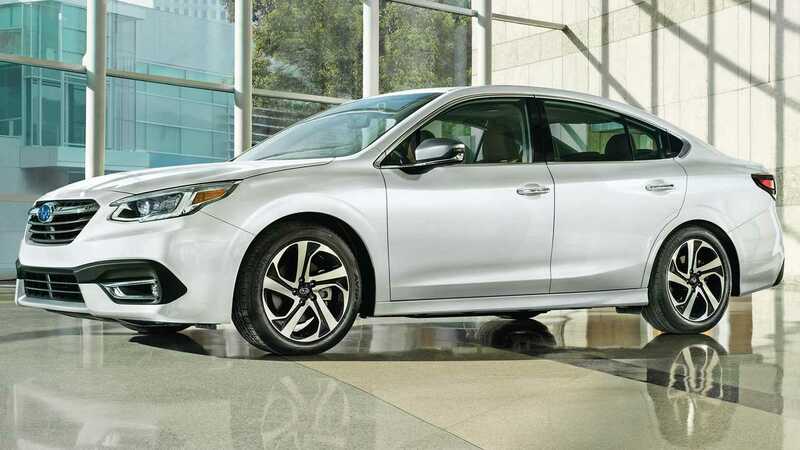 Chicago, IL – February 7, 2019 – Subaru of America today introduced the all-new seventh- generation 2020 Legacy sedan – the most advanced Legacy in the model’s 30-year history. With standard Subaru Symmetrical All-Wheel Drive and EyeSight® Driver Assist Technology as well as available tablet-style high-definition 11.6-inch SUBARU STARLINKTM multimedia screen, DriverFocusTM Distraction Mitigation System and new XT models with 260 horsepower, the 2020 Legacy offers greater technology, performance, safety and refinement than ever before. Introduced for 2017, the Subaru Global Platform has been optimized for the midsize Legacy, boasting a structure that is 70-percent stiffer in both torsional and front-suspension rigidity and 100-percent stiffer in both front lateral flexural and rear subframe rigidity compared to the previous Legacy’s platform. Notable contributors to the increased stiffness include a 13-percent jump in ultra-high-tensile-strength steel, a 371-percent increase in structural adhesive (compared to initial iteration of SGP) and, for the first time in a Subaru, a floor crossmember that is filled with a highly rigid and lightweight two-part foam material. In another Subaru first, the Legacy utilizes a full inner frame construction in which only the outer panels are welded to the structure after the entire body framework is assembled, unlike a conventional manufacturing process in which the upper and under bodies are assembled separately and then joined. This new inner frame construction is significantly stiffer and lighter than the previous Legacy’s conventional structure. For the first time since 2012, the Legacy lineup will feature a turbocharged engine. Standard on XT models, the 2.4-liter turbocharged BOXER engine delivers brisk acceleration and robust all- around performance, with 260 horsepower at 5,600 rpm and 277 lb-ft of torque from 2,000- 4,800 rpm. Mated to a high-torque Lineartronic CVT with manual mode and steering wheel paddle control switches, the 2.4-liter BOXER launches Legacy XT from 0-60 mph in an estimated 6.1 seconds. Fuel economy for the turbo is equally impressive, with a manufacturer’s estimation of 24/32 mpg city/highway. For 2020, the Legacy’s CVT hydraulic system features a lower viscosity oil that reduces horsepower loss by 32 percent compared to the previous model’s CVT, helping the new model achieve both higher fuel economy and greater driving performance. Front and center, and highlighting Legacy’s upscale interior, is an all-new tablet-style 11.6-inch Full HD multimedia display, the largest, most advanced infotainment screen ever in a Subaru. Standard on Premium, Sport and Limited, the 11.6-inch Multimedia Plus offers direct touch controls for multimedia, HVAC and vehicle settings, and includes Near Field Communication to its list of features. Like with a smartphone, app icons can be moved and configured based on personal preference. The top-of-the-line 11.6-inch Multimedia with Navigation adds navigation powered by TomTom (3-year free map updates) and voice activated navigation, and is optional for Premium, Sport and Limited and standard for Touring. A Subaru-first split-screen display can simultaneously show two types of information – e.g., navigation and audio – for improved user interaction. Both the Multimedia Plus and Multimedia with Navigation feature two rotary dial knobs, including one for audio volume. The Base model also gets an all-new multimedia system, with dual 7.0-inch Wide Video Graphics Array (WVGA) displays that split multimedia and HVAC controls. SUBARU STARLINK In-Vehicle Technology offers an integrated cockpit experience by allowing the driver to control entertainment and vehicle settings through a large touchscreen display. All STARLINK multimedia systems for the 2020 Legacy offer a high-resolution touchscreen; new on-screen controls for audio, HVAC and vehicle features; combination meter integration; smartphone integration with Apple CarPlayTM, AndroidTM Auto and new STARLINK Smart Device Link (SDL) apps; Bluetooth® hands-free phone and audio streaming connectivity; AM/FM stereo; Rear Vision Camera; SiriusXM® All Access Radio (4-month free subscription) and SiriusXM Travel Link® (3-year free subscription); HD Radio® and over-the-air updates as standard. For the first time in Legacy, available in-car Wi-Fi connectivity provides smooth internet access via high-speed LTETM communications, broadening the range of entertainment options available to rear-seat occupants using smart devices. For safety, security and convenience, SUBARU STARLINK Connected Services offers three packages that are among the most affordable in the industry. The STARLINK Safety Plus package includes SOS emergency assistance, enhanced roadside assistance, automatic collision notification, maintenance notifications, monthly vehicle health report and diagnostic alerts (3-year free subscription). For even greater peace of mind, the STARLINK Safety Plus & Security Plus package adds remote engine start with climate control and heated seats (on models equipped with Keyless Access and push- button start), stolen vehicle recovery service, vehicle security alarm notification, remote lock/unlock, remote horn and lights, remote vehicle locator and parenting features including boundary, speed and curfew alerts (6-month free trial). The STARLINK Concierge package adds the convenience of in-vehicle assistance with restaurant and hotel reservations, purchasing tickets for sporting/theater events and scheduling service appointments. Framing the large multimedia screen is a new multilayer instrument panel featuring a soft-touch wrapped surface with available real double-stitching for a high-quality appearance. The wrapped surface material and stitching employ the same color combination as the seats and door trim for a uniform look and feel. Limited and Touring models feature 10-way power front seats with lumbar support, adjustable cushion length (driver only) and heated front/rear seats. For 2020, seat heaters come with three levels of temperature adjustment as well as extended coverage up to the shoulders for improved comfort. Touring models add ventilated front seats and a heated steering wheel, with the latter optional on Limited. An available 12-speaker Harman Kardon® audio system, with Clari-FiTM compressed audio restoration technology and GreenEdgeTM high- efficiency speakers and amplifier, delivers premium sound. Following a “Dynamic x Solid” philosophy, Subaru designers incorporated a “Bold in Movement” concept when penning the new Legacy. The result is an expressive, sleek silhouette that appears to be in motion, even when stopped. With larger thickness in profile panel surfaces and a thicker appearance from the raised trunk surface, which has a smooth connection to the C- pillar, the Legacy embodies solid toughness and a dynamic active image. Wider fenders emphasize tire and wheel presence, while a frameless hexagonal grille and a lower grille intake that is molded to evoke the image of an aircraft add width and sportiness to the Legacy’s aggressive stance. A reworked side-mirror design improves not only appearance but also aerodynamics and quietness. The side mirrors can also be interlocked with seat position memory, reducing the time required to adjust mirrors before driving. In addition, the Touring trim offers power folding and reverse interlocked tilt-down functions for the side mirrors. Epitomizing Legacy’s “Bold in Movement” concept are new Touring and updated Sport models. The Touring, standard with the 2.4-liter turbo BOXER, leverages luxurious appointments inside and out, including genuine Nappa leather (a Subaru first), high-gloss black molding for the pillars, chrome plating decorated door handles and satin tone plated side mirrors. The Sport, standard with the 2.5-liter BOXER, boasts a performance-oriented exterior that features an exclusive rear bumper, front grille with high-gloss black bar, high-gloss black side mirrors, trunk lid spoiler and dark metallic 18-inch alloy wheels. Inside, the Sport comes with aluminum pedals as well as red stitching on the instrument panel, door trim, seats, shift lever boot and leather- wrapped steering wheel. The Sport also adopts an SI-DRIVE switch for varying engine output characteristics between I (Intelligent) and S# (Sport Sharp) modes, with S# offering increased acceleration response.